This month we have two lovely stories from the Me2uCentre – a dementia day care centre in Kirkby. “A wonderful group of Year 5 children from Kirkby C of E school came to visit the Me2uCentre to talk about their gardening club. 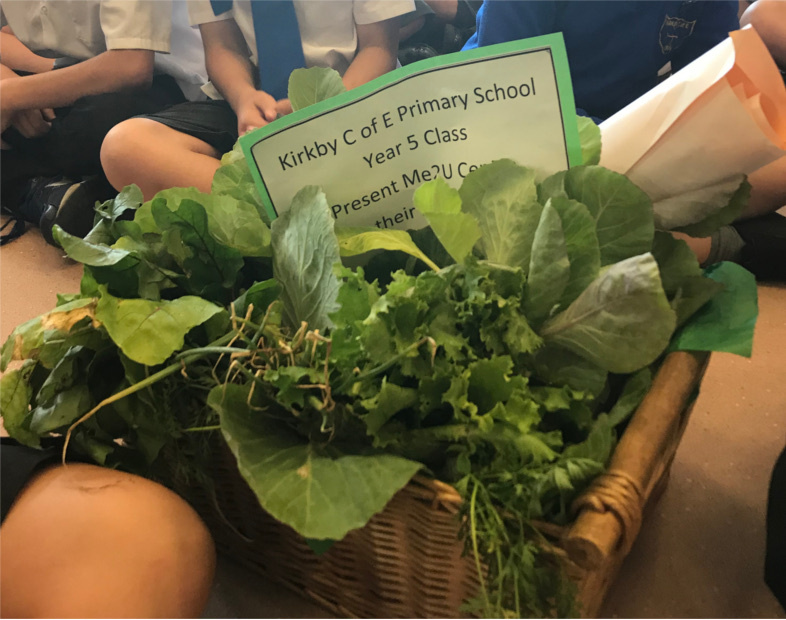 The children treated us to some lovely gifts from their allotment – home grown vegetables to share with our clients. Our Me2u family enjoyed the lovely singing the children performed, and we all joined in one final song of ‘We’ve got the whole world in our hands’. The day was a great opportunity for the local school children and our clients to integrate and discuss our forthcoming allotment plans, which the children have offered to help with. This will be the start of many visits and we can’t wait to see all of lovely visitors soon. “Me2uCentre has managed to secure apprenticeships for two young ladies who have been offering their time through volunteering and weekend work. Both girls, Mia and Katie, have been volunteering their time since the opening of the centre in March 2018. They will both benefit from the experience of being able to learn on the job and a valuable insight into their chosen career path in health and social care. For more information about Me2uCentre please contact Amanda, Angela or Rosie on 07888649822 or email info@me2ucentre.co.uk.